Tuvalu ( or ), formerly known as the Ellice Islands, is a Polynesian island nation located in the Pacific Ocean, midway between Hawaii and Australia. It comprises three reef islands and six true atolls spread out between the latitude of 5° to 10° south and longitude of 176° to 180°, west of the International Date Line. Tuvalu's Exclusive Economic Zone (EEZ) covers an oceanic area of approximately 900,000 km2. Its nearest neighbours are Kiribati, Nauru, Samoa and Fiji. Its population of 10,837 makes it the third-least populous sovereign state in the world, with only the Vatican City and Nauru having fewer inhabitants. In terms of physical land size, at just 26 square kilometres (10 sq mi) Tuvalu is the fourth smallest country in the world, larger only than the Vatican City at 0.44 km2 (0.17 sq mi), Monaco at 1.98 km2 (0.76 sq mi), and Nauru at 21 km2 (8.1 sq mi). Its small size and population, along with lack of natural resources, makes Tuvalu the smallest economy by GDP. ^ a b c d "Tuvalu: Millennium Development Goal Acceleration Framework – Improving Quality of Education". Ministry of Education and Sports, and Ministry of Finance and Economic Development from the Government of Tuvalu; and the United Nations System in the Pacific Islands. April 2013. Retrieved 13 October 2013. ^ "Tuvalu Islands". Retrieved 21 October 2011. ^ Dr A J Tilling & Ms E Fihaki (17 November 2009). Tuvalu National Biodiversity Strategy and Action Plan. Fourth National Report to the Convention on Biological Diversity. p. 7. ^ Noatia P. Teo, Hugh Larcy (ed) (1983). "Chapter 17, Colonial Rule". Tuvalu: A History. University of the South Pacific/Government of Tuvalu. pp. 127–139. ^ McIntyre, W. David (2012). "The Partition of the Gilbert and Ellice Islands". Island Studies Journal 7 (1): 135–146. ^ Howe, Kerry (2003). The Quest for Origins. New Zealand: Penguin. pp. 68, 70. ^ Sogivalu, Pulekau A. (1992). A Brief History of Niutao. Institute of Pacific Studies, University of the South Pacific. ^ Kennedy, Donald G. (1929). "Field Notes on the Culture of Vaitupu, Ellice Islands". Journal of the Polynesian Society 38: 2–5. ^ a b Maude, H.E. (1959). "Spanish Discoveries in the Central Pacific: A Study in Identification". The Journal of the Polynesian Society 68 (4): 284–326. ^ a b c d Chambers, Keith S. and Munro, Doug (1980). "The Mystery of Gran Cocal: European Discovery and Mis-Discovery in Tuvalu". The Journal of the Polynesian Society 89 (2): 167–198. ^ "De Peyster, Arent Schuyler, 1779–1863. Details of the discovery of the Ellice and de Peyster Islands in the Pacific Ocean in May, 1819". Bibliothèque nationale du Québec. ^ a b Maude, H.E. (November 1986). "Post-Spanish Discoveries in the Central Pacific". The Journal of the Polynesian Society 70 (1): 67–111. ^ Munro, Doug (November 1986). "De Peyster's Rebecca Logbook, 1818–1824". Pacific Studies 10 (1): 146. ^ Munro, Doug (November 1988). "A Further Note on De Peyster's Rebecca Logbook, 1818–1824". Pacific Studies 12 (1): 198–199. ^ Simati Faanin, Hugh Laracy (ed.) (1983). "Chapter 16 – Travellers and Workers". Tuvalu: A History. Institute of Pacific Studies, University of the South Pacific and Government of Tuvalu. p. 122. ^ Newton, W.F. (1967). "The Early Population of the Ellice Islands". The Journal of the Polynesian Society 76 (2): 197–204. ^ Bedford, Richard; Macdonald, Barrie and Munro, Doug (1980). "Population Estimates for Kiribati and Tuvalu". J. of the Polynesian Society 89 (1): 199. ^ "The 150th anniversary of the introduction of Christianity in Nukulaelae". Tuvaluislands.com. 18 May 2011. Retrieved 2 April 2013. ^ Goldsmith, Michael and Munro, Doug (2002). The accidental missionary: tales of Elekana. Macmillan Brown Centre for Pacific Studies, University of Canterbury. ^ a b Munro, D. (1996). "Samoan Pastors in Tuvalu, 1865–1899". In D. Munro & A. Thornley. The Covenant Makers: Islander Missionaries in the Pacific. Suva, Fiji, Pacific Theological College and the University of the South Pacific. pp. 124–157. ^ Resture, Jane. , 1892 visit to Ellice Islands under Captain Davis)"H.M.S. Royalist"TUVALU HISTORY – The Davis Diaries (. Retrieved 20 September 2011. ^ a b Mahaffy, Arthur (1910). "(CO 225/86/26804)". Report by Mr. Arthur Mahaffy on a visit to the Gilbert and Ellice Islands. Great Britain, Colonial Office, High Commission for Western Pacific Islands (London: His Majesty's Stationery Office). ^ a b Munro, Doug (1987). "The Lives and Times of Resident Traders in Tuvalu: An Exercise in History from Below". Pacific Studies 10 (2): 73. ^ The Aristocrat and His Cannibals" Count Festetics von Tolna's travels in Oceania, 1893–1896""". musée du quai Branly. Retrieved 1 August 2012. ^ Lal, Andrick. 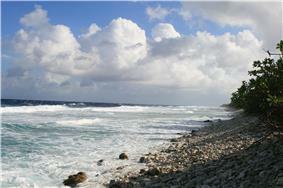 South Pacific Sea Level & Climate Monitoring Project - Funafuti atoll. SPC Applied Geoscience and Technology Division (SOPAC Division of SPC). pp. 35 & 40. ^ "TO THE EDITOR OF THE HERALD". ^ Hedley, Charles (1896). General account of the Atoll of Funafuti. Australian Museum Memoir 3(2): 1–72. ^ Hedley, Charles (1897). The ethnology of Funafuti. Australian Museum Memoir 3(4): 227–304. ^ Waite, Edgar R. (1897). The mammals, reptiles, and fishes of Funafuti. Australian Museum Memoir 3(3): 165–202. ^ Rainbow, William J. (1897). The insect fauna of Funafuti. Australian Museum Memoir 3(1): 89–104. ^ a b "Palamene o Tuvalu (Parliament of Tuvalu)". Inter-Parliamentary Union. 1981. Retrieved 7 March 2013. ^ "Tuvalu govt yet to address Fiji travel ban on Chief Justice". Radio New Zealand International. 14 August 2013. Retrieved 14 August 2013. ^ a b Corrin-Care, Jennifer; Newton, Tess and Paterson, Don (1999). Introduction to South Pacific Law. London: Cavendish Publishing Ltd.
^ Komai, Makereta (5 September 2013). "Tuvalu ready to support Marshall Islands in climate change leadership". Islands Business. Retrieved 7 September 2013. ^ a b "United States and Pacific Islands Strengthen Fisheries Cooperation". US Embassy – Papua New Guinea. 10 May 2013. Retrieved 3 September 2013. ^ a b Coutts, Geraldine (16 May 2013). "US signs new tuna agreement with the Pacific". Radio Australia. Retrieved 3 September 2013. ^ The Secretary General (19 July 2013). "Samoa, Tonga and Tuvalu Sign the MOU to establish Trade and Development Facility". Press Statement 40/13, Pacific Islands Forum Secretariat. Retrieved 27 July 2013. ^ a b c d e f g Peter Bennetts and Tony Wheeler (2001). Time & Tide: The Islands of Tuvalu. Lonely Planet. ^ a b c d e f g Andrew McIntyre, Brian Bell, and Solofa Uota (February 2012). Fakafoou – To Make New": Tuvalu Infrastructure Strategy and Investment Plan""". Government of Tuvalu. Retrieved 13 October 2013. ^ Tuvalu's official Tourism web site. Timelesstuvalu.com. Retrieved on 14 July 2013. ^ a b "New Zealand Ministry of Foreign Affairs and Trade (MFAT)". Retrieved 1 September 2010. ^ a b c "Tuvalu: 2010 Article IV Consultation-Staff Report; Public Information Notice on the Executive Board Discussion; and Statement by the Executive Director for Tuvalu". International Monetary Fund Country Report No. 11/46. 8 February 2011. Retrieved 4 September 2011. ^ Tuvalu: 2012 Article IV Consultation—IMF Country Report No. 12/259: IMF Executive Board Concludes 2012 Article IV Consultation with Tuvalu. International Monetary Fund. September 2012. p. 55. ^ a b c "New Zealand Ministry of Foreign Affairs and Trade: Aid Program (Tuvalu)". Retrieved 1 September 2010. ^ ".TV is Turned On… Again.". Daily Domain. 4 May 2007. Retrieved 24 June 2010. ^ "Tuvalu wants more money for its internet domain". Radio Australia. 8 July 2010. Retrieved 7 November 2013. ^ "European Commission launches new wave of development strategies with 13 Pacific Island States (IP/07/1552)". 18 October 2007. Retrieved 2 September 2010. ^ Daniel Gay, editor. Tuvalu Diagnostic Trade Integration Study – 2010 Report. Suva, Fiji: UNDP Multi Country Office. ^ "Tuvalu – Draft Country Review Paper, Implementation in Asia and the Pacific of the Brussels Programme of Action for the Least Developed Countries for the Decade 2001–2010: progress made, obstacles encountered and the way forward". The United Nations. 8 January 2010. Retrieved 24 October 2011. ^ "Tuvalu wants to maintain LDC status". Island Business. 17 September 2013. Retrieved 19 September 2013. ^ a b c d e f "Tuvalu". The World Factbook (CIA). ^ Lifuka, Neli (1978). Koch, Klaus-Friedrich, ed. Logs in the current of the sea : Neli Lifuka's story of Kioa and the Vaitupu colonists. Australian National University Press/Press of the Langdon Associates. ^ a b "Government announces Pacific access scheme". Mark Gosche, Pacific Island Affairs Minister (NZ). 20 December 2001. Retrieved 5 November 2011. ^ "Tuvalu – Decent work country program". International Labour Organization. 11 May 2010. Retrieved 5 November 2011. ^ Hedley, Charles (1896). General account of the Atoll of Funafuti. Australian Museum Memoir 3(2): 1–72. pp. 46–52. ^ a b c Hedley, Charles (1896). General account of the Atoll of Funafuti. Australian Museum Memoir 3(2): 1–72. pp. 40–41. ^ a b Goldsmith, Michael. (1985). 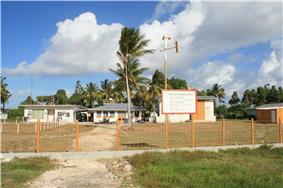 Transformations of the Meeting-House in Tuvalu. In Antony Hooper and Judith Huntsman, eds., ‘Transformations of Polynesian Culture’ Polynesian Society. ^ Panapa, Tufoua (2012). "Ethnographic Research on Meanings and Practices of Health in Tuvalu: A Community Report". Report to the Tuvaluan Ministries of Health and Education: Ph D Candidate Centre for Development Studies – "Transnational Pacific Health through the Lens of Tuberculosis" Research Group. Department of Anthropology, The University of Auckland, N.Z. pp. 39–41. Retrieved 16 March 2013. ^ a b Tiraa-Passfield, Anna (September 1996). "The uses of shells in traditional Tuvaluan handicrafts". SPC Traditional Marine Resource Management and Knowledge Information Bulletin #7. Retrieved 8 February 2014. ^ a b Linkels, Ad. The Real Music of Paradise. Rough Guides, Broughton, Simon and Ellingham, Mark with McConnachie, James and Duane, Orla (Ed.). p. 221. ^ Murphy, Victoria (18 September 2012). "Game of thrones: Duke and Duchess of Cambridge play king and queen before dancing the night away in Tuvalu". Mirror Online Edition (London). Retrieved 21 October 2012. ^ English, Rebecca (18 September 2012). "Swaying to the South Pacific beat: Duke and Duchess of Cambridge don grass skirts to join in tribal dance on final leg of royal tour". Mail Online Edition (London). Retrieved 21 October 2012. ^ Hedley, Charles (1896). General account of the Atoll of Funafuti. Australian Museum Memoir 3(2): 1–72. pp. 60–63. ^ a b "Te Kakeega II – National Strategies for Sustainable Development 2005–2015". Government of Tuvalu. 2005. Retrieved 14 October 2011. ^ "Tuvalu-News.TV". Retrieved 31 October 2012. ^ Panapa, Tufoua (2012). "Ethnographic Research on Meanings and Practices of Health in Tuvalu: A Community Report". Report to the Tuvaluan Ministries of Health and Education: Ph D Candidate Centre for Development Studies – "Transnational Pacific Health through the Lens of Tuberculosis" Research Group. Department of Anthropology, The University of Auckland, N.Z. p. 19, footnote 4. Retrieved 16 March 2013. ^ Hedley, Charles (1896). General account of the Atoll of Funafuti. Australian Museum Memoir 3(2): 1–72. p. 56. ^ Lalua, Silafaga (15 March 2007). "Volleyball tournament for 2007 start". Tuvalu-News.TV. Retrieved 31 October 2012. ^ Lalua, Silafaga (10 January 2007). "Rugby Union starts up". Tuvalu-News.TV. Retrieved 31 October 2012. ^ a b c d "CGF - Tuvalu". Commonwealth Games Federation. Retrieved 15 May 2014. ^ "Medal Tally". XIVth Pacific Games, 27 August – 10 September 2011. Archived from the original on 10 October 2012. Retrieved 18 November 2011. ^ Lalua, Silafaga (9 July 2007). "Tuvalu in the IOC". Tuvalu-News.TV. Retrieved 31 October 2012. ^ Fiji shipping agent, Williams & Gosling. ^ Endou, Shuuichi (30 December 2011). "New AM Radio Station in Funafuti". Tuvalu-News.TV. Retrieved 31 October 2012. ^ Maui, Atufenua; Kwato'o, Tony; Vetter, Ronald; Chisaki, Yoshifumi and Usagawa, Tsuyoshi (June 2012). "Preliminary Use of an E-learning Pilot System for Secondary Educational Institutions in Tuvalu: The Initial Implementation". International Journal of e-Education, e-Business, e-Management and e-Learning 2 (3). ^ Panapa, Tufoua (2012). "Ethnographic Research on Meanings and Practices of Health in Tuvalu: A Community Report". Report to the Tuvaluan Ministries of Health and Education: Ph D Candidate Centre for Development Studies – "Transnational Pacific Health through the Lens of Tuberculosis" Research Group. Department of Anthropology, The University of Auckland, N.Z. Retrieved 16 March 2013. ^ Resture, Setapu Asenati (March 2010). "TE MAAMA PALA: Continuity and change in coping with Tuberculosis in Tuvalu". A thesis submitted in partial fulfilment of the requirements of the degree of Masters of Arts in History – The University of Auckland, N.Z. Retrieved 16 March 2013. ^ "Basic Education (Tuvalu)". UNESCO Bangkok. Retrieved 20 November 2012. ^ "Pacific Senior Secondary Certificate (PSSC)". Secretariat of the Pacific Board for Educational Assessment. Retrieved 20 November 2012. ^ "New disciplinary policy for Motufoua High School". tuvalu-news.tv. 27 October 2006. Retrieved 20 November 2012. ^ Bakalevu, Salanieta and Manuella, David (June 2011). "Open Schooling as a Strategy for Second-chance Education in the Pacific: A desk study report". Commonwealth of Learning (COL) / University of the South Pacific. pp. 96–100. Retrieved 20 November 2012. ^ "Tuvalu". 2009 Findings on the Worst Forms of Child Labor. Bureau of International Labor Affairs, U.S. Department of Labor (2002). This article incorporates text from this source, which is in the public domain. ^ Sandrine Job, Dr. Daniela Ceccarelli (December 2011). "Tuvalu Marine Life Synthesis Report". an Alofa Tuvalu project with the Tuvalu Fisheries Department. Retrieved 3 December 2013. ^ Sandrine Job, Dr. Daniela Ceccarelli (December 2012). "Tuvalu Marine Life Scientific Report". an Alofa Tuvalu project with the Tuvalu Fisheries Department. Retrieved 3 December 2013. ^ "Global Warming". The Luaseuta Foundation. Archived from the original on 6 September 2011. Retrieved 14 October 2011. ^ a b Mason, Moya K. "Tuvalu: Flooding, Global Warming, and Media Coverage". Retrieved 13 October 2011. ^ Carter, Ralf (4 July 1986). "Wind and Sea Analysis – Funafuti Lagoon, Tuvalu". South Pacific Regional Environmental Programme and UNDP Project RAS/81/102 (Technical. Report No. 58 of PE/TU.3). Archived from the original on 18 January 2012. Retrieved 4 November 2011. ^ a b Lusama, Tafue (29 November 2011). "Tuvalu plight must be heard by UNFCC". The Drum – Australian Broadcasting Corporation. Retrieved 29 November 2011. ^ Whitty, Julia (July–August 2003). All the Disappearing Islands. Mother Jones. ^ Govan, Hugh et al. (June 2007). "Funafuti Atoll Coral Reef Restoration Project – baseline report". Coral Reefs in the Pacific (CRISP), Nouméa. Retrieved 26 October 2011. ^ Baarsch, Florent (4 March 2011). "Warming oceans and human waste hit Tuvalu's sustainable way of life". The Guardian (London). ^ a b "Tuvalu / Water, Waste and Sanitation Project (TWWSP): CRIS FED/2009/021-195, ANNEX". European Union. Retrieved 24 October 2011. ^ Lewis, James (December 1989). "Sea level rise: Some implications for Tuvalu". ^ Resture, Jane. Hurricane 1883. Tuvalu and the Hurricanes: ‘Gods Who Die’ by Julian Dana as told by George Westbrook. ^ Pasoni Taafaki, Hugh Laracy (ed.) (1983). "Chapter 2 – The Old Order". Tuvalu: A History. Institute of Pacific Studies, University of the South Pacific and Government of Tuvalu. p. 27. ^ Resture, Jane (5 October 2009). Hurricane Bebe 1972. Tuvalu and the Hurricanes: ‘The Hurricane in Funafuti, Tuvalu’ by Pasefika Falani (Pacific Frank). ^ Prasad, Rajendra (May 3, 1990). ﻿Tropical Cyclone Ofa, January 31 - February 7, 1990﻿ (Tropical Cyclone Report 90/4). Fiji Meteorological Service. Archived from the original on February 13, 2014. http://www.webcitation.org/6NMhpm68N. Retrieved February 13, 2014. ^ Koop, Neville L; Fiji Meteorological Service (Winter 1991). DeAngellis, Richard M. ed. ﻿Samoa Depression﻿ (Mariners Weather Log). 35. United States National Oceanic and Atmospheric Administration's National Oceanographic Data Service. p. 53. ISSN 0025-3367. OCLC 648466886. hdl:2027/uiug.30112104094104. ^ ﻿Report on the disaster preparedness workshop held in Funafuti, Tuvalu, 14 - 17 October, 1991﻿. Australian Overseas Disaster Response Organisation. April 1992. pp. 2-3, 6. ISBN . http://www.pacificdisaster.net/pdnadmin/data/original/JB-DM_148_TUV_1991_disaster_workshop_report.pdf. ^ a b Patel, S. S. (2006). "A sinking feeling". Nature 440 (7085): 734–736. ^ a b Hunter, J. A. (2002). Note on Relative Sea Level Change at Funafuti, Tuvalu. Retrieved 13 May 2006. ^ Farbotko, Farbotko. "Saving Tuvaluan Culture from Imminent Danger". Climate Change: Risks and Solutions, 'Sang Saeng', pages 11–13, No 21 Spring 2008. Asia-Pacific Centre of Education for International Understanding (APCEIU) under the auspices of UNESCO. Retrieved 20 November 2012. ^ "Pacific Adaptation to Climate Change Tuvalu Report of In-Country Consultations". Secretariat of the Pacific Regional Environment Program (SPREC). 2009. Retrieved 13 October 2011. ^ a b "Tuvalu's Views on the Possible Security Implications of Climate Change to be included in the report of the UN Secretary General to the UN General Assembly 64th Session". Retrieved 17 February 2012. ^ Vincent Gray (15 June 2006). "The Truth about Tuvalu". Retrieved 13 October 2011. ^ de Freitas, Chris (11 December 2013). "Human interference real threat to Pacific atolls". Islands Business from NZ HERALD/PACNEWS. Retrieved 12 December 2013. ^ a b Hunter, John R. (2002). "A Note on Relative Sea Level Change at Funafuti, Tuvalu". Antarctic Cooperative Research Centre. Retrieved 13 October 2011. ^ Mason, Moya K. (1983). Tuvalu: Flooding, Global Warming, and Media Coverage. Moya K. Mason I. ^ Anne Fauvre Chambers, Keith Stanley Chambers (2007). Five Takes on Climate and Cultural Change in Tuvalu. 19 (1) The Contemporary Pacific 294-306I. ^ Arthur P. Webba & Paul S. Kench (2010). "The dynamic response of reef islands to sea-level rise: Evidence from multi-decadal analysis of island change in the Central Pacific". Global and Planetary Change 72 (3): 234–246. ^ SOPAC. 2005. Tuvalu – Environmental Vulnerability Index. Retrieved 13 May 2006. ^ "El Niño and La Niña". Australian Government Bureau of Meteorology. Retrieved 9 October 2011. ^ Vula, Timoci (6 October 2011). "Serious' on Tuvalu". ^ "Information Bulletin – Tuvalu Drought". International Federation of Red Cross and Red Crescent Organisations. 14 October 2011. Retrieved 7 November 2011. ^ Manhire, Toby (17 October 2011). "Tuvalu drought could be dry run for dealing with climate change". London: The Guardian. Retrieved 21 October 2011. ^ Macrae, Alistair (11 October 2011). "Tuvalu in a fight for its life". The Drum – Australian Broadcasting Corporation. Retrieved 12 October 2011. ^ "NZ responds to Tuvalu fresh water emergency". New Zealand Herald. 3 October 2011. ^ Marles, Richard, Parliamentary Secretary for Pacific Island Affairs (Australia) (12 October 2011). "Climate change poses a Pacific problem". The Punch – News Limited. Archived from the original on 13 October 2011. Retrieved 12 October 2011. 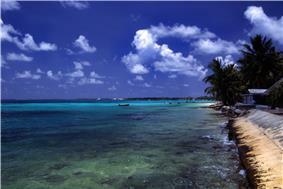 ^ "Island Climate Update 143 – August 2012". NIWA, the National Institute of Water and Atmospheric Research of New Zealand. 3 August 2012. Retrieved 15 August 2012. ^ "El Niño/Southern Oscillation (ENSO) Diagnostic Discussion". Climate Prediction Center National Centers for Environmental Prediction - NOAA/National Weather Service. 10 April 2014. Retrieved 15 April 2014. ^ "Draft National Biosafety Framework of Tuvalu". Department of Environment, Ministry of Natural Resources & Environment, Government of Tuvalu. September 2008. Retrieved 22 March 2014. Koch, Gerd, Die Materielle Kulture der Ellice-Inseln, Berlin: Museum fur Volkerkunde (1961); The English translation by Guy Slatter, was published as The Material Culture of Tuvalu, University of the South Pacific in Suva (1981) ASIN B0000EE805. Rainwater harvesting is the principal source of freshwater in Tuvalu. Nukufetau, Vaitupu and Nanumea are the only islands with sustainable groundwater supplies. The effectiveness of rainwater harvesting is diminished because of poor maintenance of roofs, gutters and pipes. Reverse Osmosis (R/O) desalination units supplement rainwater harvesting on Funafuti. The 65 m3 desalination plant operates at a real production level of around 40 m³ per day. R/O water is only intended to be produced when storage falls below 30%, however demand to replenish household storage supplies with tanker-delivered water means that the R/O desalination units are continually operating. Water is delivered at a cost of A$3.50 per m³. Cost of production and delivery has been estimated at A$6 per m³, with the difference subsidised by the government. Tuvalu is working with the South Pacific Applied Geoscience Commission (SOPAC) to implement composting toilets and to improve the treatment of sewage sludge from septic tanks on Fongafale as septic tanks are leaking into the freshwater lens in the sub-surface of the atoll as well as the ocean and lagoon. Composting toilets reduce water use by up to 30%. In July 2012 a United Nations Special Rapporteur called on the Tuvalu Government to develop a national water strategy to improve access to safe drinking water and sanitation. In 2012, Tuvalu developed a National Water Resources Policy under the Integrated Water Resource Management (IWRM) Project and the Pacific Adaptation to Climate Change (PACC) Project, which are sponsored by the Global Environment Fund/SOPAC. Government water planning has established a target of between 50 and 100L of water per person per day accounting for drinking water, cleaning, community and cultural activities. The Constitution of Tuvalu does not specifically refer to the conservation of resources and sound environmental or resource management; however the rights of future generations are acknowledged in Principles 2 & 3 of the Constitution, which refer to the welfare of the people of Tuvalu, both present and future. The Waste Operations and Services Act of 2009 provides the legal framework for waste management and pollution control projects. The La Niña event that caused the drought ended in April–May 2012; by August 2012 the El Niño-Southern Oscillation (ENSO) Conditions indicated that the Tropical Pacific Ocean was moving to an El Niño event. A 58% chance that an El Niño event will occur in late 2014 and into 2015 was predicted by NOAA's Climate Prediction Center. The governments of Australia and New Zealand responded to the 2011 fresh-water crisis by supplying temporary desalination plants, and assisted in the repair of the existing desalination unit that was donated by Japan in 2006. In response to the 2011 drought, Japan funded the purchase of a 100 m³/d desalination plant and two portable 10 m³/d plants as part of its Pacific Environment Community (PEC) program. Aid programs from the European Union and Australia also provided water tanks as part of the longer term solution for the storage of available fresh water. Tuvalu experiences the effects of El Niño and La Niña caused by changes in ocean temperatures in the equatorial and central Pacific. El Niño effects increase the chances of tropical storms and cyclones, while La Niña effects increase the chances of drought. Typically the islands of Tuvalu receive between 200mm to 400mm of rainfall per month. However, in 2011 a weak La Niña effect caused a drought by cooling the surface of the sea around Tuvalu. A state of emergency was declared on 28 September 2011; with rationing of fresh-water on the islands of Funafuti and Nukulaelae. Households on Funafuti and Nukulaelae were restricted to two buckets of fresh water per day (40 litres). In spite of persistent Internet rumours that New Zealand has agreed to accept an annual quota of 75 evacuees, the annual quota of 75 Tuvaluans granted work permits under the Pacific Access Category (announced in 2001) is not related to environmental concerns. Employment opportunities and family reunification has been the primary motivation of Tuvaluans who obtain New Zealand work permits under the Pacific Access Category. While some commentators have called for the relocation of Tuvalu's population to Australia, New Zealand or Kioa in Fiji, in 2006 Maatia Toafa (Prime Minister from 2004–2006) said his government did not regard rising sea levels as such a threat that the entire population would need to be evacuated. In 2013 Enele Sopoaga, the prime minister of Tuvalu, said that relocating Tuvaluans to avoid the impact of sea level rise "should never be an option because it is self defeating in itself. For Tuvalu I think we really need to mobilise public opinion in the Pacific as well as in the [rest of] world to really talk to their lawmakers to please have some sort of moral obligation and things like that to do the right thing." The atolls have shown resilience to gradual sea-level rise, with atolls and reef islands being able to grow under current climate conditions by generating sufficient sand and shingle that accumulates and gets dumped on the islands during cyclones. Gradual sea-level rise also allows for coral polyp activity to increase the reefs. However if the increase in sea level occurs at faster rate as compared to coral growth, or if polyp activity is damaged by ocean acidification, then the resilience of the atolls and reef islands is less certain. Observable transformations over the last ten to fifteen years show Tuvaluans that there have been changes to the sea levels. These include sea water bubbling up through the porous coral rock to form pools at high tide and the flooding of low-lying areas including the airport during spring tides and king tides. Whether there are measurable changes in the sea level relative to the islands of Tuvalu is a contentious issue. There were problems associated with the pre-1993 sea level records from Funafuti which resulted in improvements in the recording technology to provide more reliable data for analysis. The degree of uncertainty as to estimates of sea level change relative to the islands of Tuvalu was reflected in the conclusions made in 2002 from the available data. The 2011 report of the Pacific Climate Change Science Program published by the Australian Government, concludes: "The sea-level rise near Tuvalu measured by satellite altimeters since 1993 is about 5 mm per year." As low-lying islands lacking a surrounding shallow shelf, the communities of Tuvalu are especially susceptible to changes in sea level and undissipated storms. At its highest, Tuvalu is only 4.6 metres (15 ft) above sea level, and Tuvaluan leaders have been concerned about the effects of rising sea levels for a few years. It is estimated that a sea level rise of 20–40 centimetres (8–16 inches) in the next 100 years could make Tuvalu uninhabitable. Tuvalu experiences westerly gales and heavy rain from October to March – the period that is known as Tau-o-lalo; with tropical temperatures moderated by easterly winds from April to November. Drinking water is mainly obtained from rainwater collected on roofs and stored in tanks. These systems are often poorly maintained, resulting in a lack of water. Aid programmes of Australia and the European Union have been directed to improving the storage capacity on Funafuti and in the outer islands. Cyclone Bebe in 1972 caused severe damage to Funafuti. Funafuti's Tepuka Vili Vili islet was devastated by Cyclone Meli in 1979, with all its vegetation and most of its sand swept away during the cyclone. Along with a tropical depression that affected the islands a few days later, Severe Tropical Cyclone Ofa had a major impact on Tuvalu with most islands reporting damage to vegetation and crops. Cyclone Gavin was first identified during 2 March 1997, and was the first of three tropical cyclones to affect Tuvalu during the 1996–97 cyclone season with Cyclones Hina and Keli following later in the season. Because of the low elevation, the islands that make up this nation are vulnerable to the effects of tropical cyclones and by the threat of current and future sea level rise. The highest elevation is 4.6 metres (15 ft) above sea level on Niulakita, which gives Tuvalu the second-lowest maximum elevation of any country (after the Maldives). The highest elevations are typically in narrow storm dunes on the ocean side of the islands which are prone to overtopping in tropical cyclones, as occurred with Cyclone Bebe, which was a very early-season storm that passed through the Tuvaluan atolls in October 1972. Cyclone Bebe submerged Funafuti, eliminating 90% of structures on the island. Sources of drinking water were contaminated as a result of the system's storm surge and the flooding of the sources of fresh water. The eastern shoreline of Funafuti Lagoon was modified during World War II when the airfield (what is now Funafuti International Airport) was constructed. The coral base of the atoll was used as fill to create the runway. The resulting borrow pits impacted the fresh-water aquifer. At these pits, the sea water can be seen bubbling up through the porous coral rock to form pools with each high tide. Several piers were also constructed in the lagoon, beach areas were filled and deep water access channels were excavated. These alterations to the reef and shoreline resulted in changes to wave patterns with less sand accumulating to form the beaches as compared to former times and the shoreline is now exposed to wave action. Several attempts to stabilise the shoreline have not achieved the desired effect. The reefs at Funafuti have suffered damage, with 80 per cent of the coral becoming bleached as a consequence of the increase in ocean temperatures and ocean acidification. The coral bleaching, which includes staghorn corals, is attributed to the increase in water temperature that occurred during the El Niños that occurred from 1998–2000 and from 2000–2001. A reef restoration project has investigated reef restoration techniques; and researchers from Japan have investigated rebuilding the coral reefs through the introduction of foraminifera. The project of the Japan International Cooperation Agency is designed to increase the resilience of the Tuvalu coast against sea level rise through ecosystem rehabilitation and regeneration and through support for sand production. Tuvalu consists of three reef islands and six true atolls. Its small, scattered group of atolls have poor soil and a total land area of only about 26 square kilometres (less than 10 sq. mi) making it the fourth smallest country in the world. The islets that form the atolls are very low lying. Nanumanga, Niutao, Niulakita are reef islands and the six true atolls are Funafuti, Nanumea, Nui, Nukufetau, Nukulaelae and Vaitupu. Funafuti is the largest atoll of the nine low reef islands and atolls that form the Tuvalu volcanic island chain. It comprises numerous islets around a central lagoon that is approximately 25.1 kilometres (15.6 miles) (N–S) by 18.4 kilometres (11.4 miles) (W-E), centred on 179°7'E and 8°30'S. On the atolls, an annular reef rim surrounds the lagoon with several natural reef channels. Surveys were carried out in May 2010 of the reef habitats of Nanumea, Nukulaelae and Funafuti and a total of 317 fish species were recorded during this Tuvalu Marine Life study. The surveys identified 66 species that had not previously been recorded in Tuvalu, which brings the total number of identified species to 607. Required attendance at school is 10 years for males and 11 years for females (2001). The adult literacy rate is 99.0% (2002). In 2010, there were 1,918 students who were taught by 109 teachers (98 certified and 11 uncertified). The teacher-pupil ratio for primary schools in Tuvalu is around 1:18 for all schools with the exception of Nauti School, which has a student-teacher ratio of 1:27. Nauti School on Funafuti is the largest primary in Tuvalu with more than 900 students (45 percent of the total primary school enrolment). The pupil-teacher ratio for Tuvalu is low compared to the Pacific region (ratio of 1:29). The Princess Margaret Hospital on Funafuti is the only hospital in Tuvalu. The Tuvaluan medical staff at PMH in 2011 comprised the Director of Health & Surgeon, the Chief Medical Officer Public Health, an anaesthetist, a paediatric medical officer and an obstetrics and gynaecology medical officer. Allied health staff include two radiographers, two pharmacists, three laboratory technicians, two dieticians and 13 nurses with specialised training in fields including surgical nursing, anaesthesia nursing/ICU, paediatric nursing and midwifery. PMH also employs a dentist. The Department of Health also employs nine or ten nurses on the outer islands to provide general nursing and midwifery services. Communications in Tuvalu rely on satellite dishes for telephone and internet access. The available bandwidth is only 512 kbit/s uplink, and 1.5 Mbit/s downlink. Throughout Tuvalu are more than 900 subscribers who want to use the satellite service, with demand slowing down the speed of the entire system. The Tuvalu Telecommunications Corporation (TCC), a state-owned enterprise, provides fixed line telephone communications to subscribers on each island, mobile phone services on Funafuti, Vaitupu and Nukulaelae and is a distributor of the Fiji Television service (Sky Pacific satellite television service). The Tuvalu Media Corporation (TMC) operates Radio Tuvalu, which broadcasts from Funafuti. In 2011 the Japanese government provided financial support to construct a new AM broadcast studio. The installation of upgraded transmission equipment allows Radio Tuvalu to be heard on all nine islands of Tuvalu. The new AM radio transmitter on Funafuti replaced TMC's FM radio service to the outer islands and freed up satellite bandwidth for mobile services. The single airport is Funafuti International Airport. It is a tarred strip. Air Pacific, the owner of Fiji Airlines (trading as Fiji Link) operates services 3 times a week (Tuesday, Thursday and Saturday) between Suva (originating from Nadi) and Funafuti with ATR 72-600, a 68-seat plane. The Nivaga II and Manu Folau provide round trip visits to the outer islands every three or four weeks. The Manu Folau is a 50-meter vessel that was a gift from Japan to the people of Tuvalu. 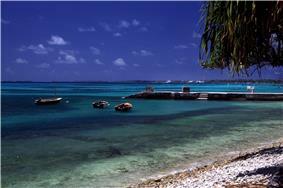 Funafuti is the only port but there is a deep-water berth in the harbour at Nukufetau. The merchant marine fleet consists of two passenger/cargo ships Nivaga II and Manu Folau. These ships carry cargo and passengers between the main atolls and travel between Suva, Fiji and Funafuti 3 to 4 times a year. Transport services in Tuvalu are limited. There are about eight kilometres of roads. The streets of Funafuti were paved and lit in mid-2002 but other roads are unpaved. Tuvalu is among a few countries that do not have railroads. In 2013, Tuvalu was granted Associate status in the Oceania Continent Handball Federation by the International Handball Federation. The Tuvalu Association of Sports and National Olympic Committee (TASNOC) was recognised as a National Olympic Committee in July 2007. Tuvalu entered the Olympic Games for the first time at the 2008 Summer Games in Beijing, China, with a weightlifter and two athletes in the men's and women's 100-metre sprints. A team with athletes in the same events represented Tuvalu at the 2012 Summer Olympics. Tuvalu first participated in the Pacific Games in 1978 and in the Commonwealth Games in 1998, when a weightlifter attended the games held at Kuala Lumpur, Malaysia. Two table tennis players attended the 2002 Commonwealth Games in Manchester, England; Tuvalu entered competitors in shooting, table tennis and weightlifting at the 2006 Commonwealth Games in Melbourne, Australia; and three athletes participated in the 2010 Commonwealth Games in Delhi, India, entering the discus, shot put and weightlifting events. Tuvaluan athletes also participated in the men's and women's 100-metre sprints at the 2009 World Athletic Championships and 2011 World Athletic Championships. At the 2011 Pacific Games held in New Caledonia, Tuvaluan weightlifters won two silver medals and one bronze medal. Okilani Tinilau represented Tuvalu at the 2013 World Championships in the men's 100-metre sprint. Football in Tuvalu is played at club and national team level. The Tuvalu national football team trains at the Tuvalu Sports Ground in Funafuti and competes in the Pacific Games and South Pacific Games. The Tuvalu National Football Association is an associate member of the Oceania Football Confederation (OFC) and is seeking membership in FIFA. Tuvalu participates in the Tuvalu Games, which are held yearly since 2008. There are about 13,000 Tuvaluan speakers worldwide. The Tuvalu Media Corporation publishes Sikuleo o Tuvalu – Tuvalu Echo (previously: Tuvalu Echoes), a fortnightly newspaper and a news website. Tuvaluan is of the Ellicean group of Polynesian languages, distantly related to all other Polynesian languages such as Hawaiian, Māori, Tahitian, Samoan and Tongan. It is most closely related to the languages spoken on the Polynesian outliers in Micronesia and northern and central Melanesia. The language has borrowed from the Samoan language, as a consequence of Christian missionaries in the late 19th and early 20th centuries being predominantly Samoan. The Tuvaluan language and English are the national languages of Tuvalu. The Kiribati language is also spoken on the island of Nui. The traditional community system still survives to a large extent on Tuvalu. 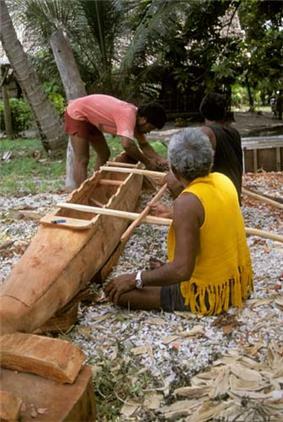 Each family has its own task, or salanga, to perform for the community, such as fishing, house building or defence. The skills of a family are passed on from parents to children. The women of Tuvalu use cowrie and other shells in traditional handicrafts. Flying fish are caught as a source of food and as an exciting activity, using a boat, a butterfly net and a spotlight to attract the flying fish. The cuisine of Tuvalu is based on the staple of coconut and the many species of fish found in the ocean and lagoons of the atolls. Desserts made on the islands include coconut and coconut milk, instead of the animal milk. The traditional foods eaten in Tuvalu are pulaka, taro, bananas, breadfruit and coconut. Tuvaluans eat seafood, including coconut crab, fish from the lagoon and ocean. A traditional food source is seabirds (taketake or Black Noddy and akiaki or White Tern), with pork being eaten mostly at fateles (or parties with dancing to celebrate events). The traditional music of Tuvalu consists of a number of dances, including fatele, fakanau and fakaseasea. The fatele, in its modern form, is performed at community events and to celebrate leaders and other prominent individuals, such as the visit of the Duke and Duchess of Cambridge in September 2012. The Tuvaluan style can be described "as a musical microcosm of Polynesia, where contemporary and older styles co-exist". The artistic traditions of Tuvalu have traditionally been expressed in the design of clothing and traditional handicrafts such as the decoration of mats and fans. The material culture of Tuvalu uses traditional design elements in artefacts used in every-day life such as the design of canoes and fish hooks made from traditional materials. 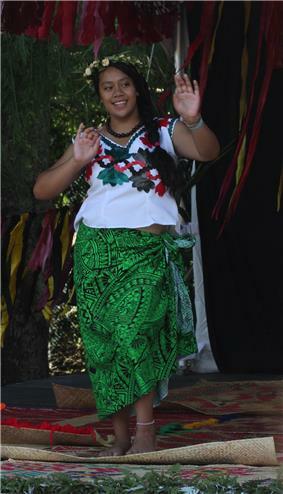 The design of women's skirts (titi), tops (teuga saka), headbands, armbands, and wristbands, which continue to be used in performances of the traditional dance songs of Tuvalu, represents contemporary Tuvaluan art and design. The church and community buildings are painted with white paint that is known as lase, which is made by burning a large amount of dead coral with firewood. The whitish powder that is the result is mixed with water and painted on the buildings. Following contact with Europeans iron products were used including nails and corrugated iron roofing material. Modern building in Tuvalu are constructed from imported building materials including imported timber and concrete. The traditional buildings of Tuvalu used plants and trees from the native broadleaf forest, including timber from: Pouka, (Hernandia peltata); Ngia or Ingia bush, (Pemphis acidula); Miro, (Thespesia populnea); Tonga, (Rhizophora mucronata); Fau or Fo fafini, or woman's fibre tree (Hibiscus tiliaceus). and fibre from: Coconut; Ferra, native fig (Ficus aspem); Fala, Screw Pine or Pandanus. The buildings were constructed without nails and were lashed and tied together with a plaited sennit rope that was handmade from dried coconut fibre. The other religions practised in Tuvalu include Seventh-day Adventist (1.4%), Bahá'í (1%) and the Ahmadiyya Muslim Community (0.4%). The introduction of Christianity ended the worship of ancestral spirits and other deities, along with the power of the vaka-atua (the priests of the old religions). Laumua Kofe describes the objects of worship as varying from island to island, although ancestor worship is described by Rev. D.J. Whitmee in 1870 as being common practice. About 97% of Tuvaluans are members of the Ekalesia Kilisiano Tuvalu (Church of Tuvalu), a Protestant Christian church. Tuvaluans continue to respect their ancestors within the context of a strong Christian faith. 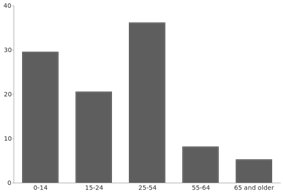 Life expectancy for women in Tuvalu is 66.9 years and 62.7 years for men (2011 est.). New Zealand has an annual quota of 75 Tuvaluans granted work permits under the Pacific Access Category, as announced in 2001. The applicants register for the Pacific Access Category (PAC) ballots; the primary criteria is that the principal applicant must have a job offer from a New Zealand employer. Tuvaluans also have access to seasonal employment in the horticulture and viticulture industries in New Zealand under the Recognised Seasonal Employer (RSE) Work Policy introduced in 2007 allowing for employment of up to 5,000 workers from Tuvalu and other Pacific islands. Tuvaluans can participate in the Australian Pacific Seasonal Worker Program, which allows Pacific Islanders to obtain seasonal employment in the Australian agriculture industry, in particular cotton and cane operations; fishing industry, in particular aquaculture; and with accommodation providers in the tourism industry. From 1947 to 1983 a number of Tuvaluans from Vaitupu migrated to Kioa, an island in Fiji. The settlers from Tuvalu were granted Fijian citizenship in 2005. In recent years New Zealand and Australia are the primary destinations for migration or seasonal work. The US government is also a major revenue source for Tuvalu. In 1999 the payment from the South Pacific Tuna Treaty (SPTT) was about $9 million, with the value increasing in the following years. In May 2013 representatives from the United States and the Pacific Islands countries agreed to sign interim arrangement documents to extend the Multilateral Fisheries Treaty (which encompasses the South Pacific Tuna Treaty) for 18 months. The Tuvalu Trust Fund was established in 1987 by the United Kingdom, Australia and New Zealand. The value of the Tuvalu Trust Fund is approximately $100 million. Financial support to Tuvalu is also provided by Japan, South Korea and the European Union. Australia and New Zealand continue to contribute capital to the Tuvalu Trust Fund and provide other forms of development assistance. Government revenues largely come from sales of fishing licenses, income from the Tuvalu Trust Fund, and from the lease of its highly fortuitous .tv Internet Top Level Domain (TLD). In 1998, Tuvalu began deriving revenue from the use of its area code for premium-rate telephone numbers and from the commercialisation of its ".tv" Internet domain name, which is now managed by Verisign until 2021. The ".tv" domain name generates around $A2.2 million each year from royalties, which is about ten per cent of the government's total revenue. Domain name income paid most of the cost of paving the streets of Funafuti and installing street lighting in mid-2002. Tuvalu also generates income from stamps by the Tuvalu Philatelic Bureau and income from the Tuvalu Ship Registry. Tuvaluans are well known for their seafaring skills, with the Tuvalu Maritime Training Institute on Amatuku motu (island), Funafuti, providing training to approximately 120 marine cadets each year so that they have the skills necessary for employment as seafarers on merchant shipping. The Tuvalu Overseas Seamen's Union (TOSU) is the only registered trade union in Tuvalu. It represents workers on foreign ships. The Asian Development Bank (ADB) estimates that 800 Tuvaluan men are trained, certified and active as seafarers. The ADB estimates that, at any one time, about 15% of the adult male population works abroad as seafarers. Banking services are provided by the National Bank of Tuvalu. Public sector workers make up about 65% of those formally employed. Remittances from Tuvaluans living in Australia and New Zealand, and remittances from Tuvaluan sailors employed on overseas ships are important sources of income for Tuvaluans. Approximately 15% of adult males work as seamen on foreign-flagged merchant ships. Agriculture in Tuvalu is focused on coconut trees and growing pulaka in large pits of composted soil below the water table. Tuvaluans are otherwise involved in traditional subsistence agriculture and fishing. From 1996 to 2002, Tuvalu was one of the best-performing Pacific Island economies and achieved an average real gross domestic product (GDP) growth rate of 5.6% per annum. Since 2002 economic growth has slowed, with GDP growth of 1.5% in 2008. Tuvalu was exposed to rapid rises in world prices of fuel and food in 2008, with the level of inflation peaking at 13.4%. The International Monetary Fund 2010 Report on Tuvalu estimates that Tuvalu experienced zero growth in its 2010 GDP, after the economy contracted by about 2% in 2009. On 5 August 2012, the Executive Board of the International Monetary Fund (IMF) concluded the Article IV consultation with Tuvalu, and assessed the economy of Tuvalu: "A slow recovery is underway in Tuvalu, but there are important risks. GDP grew in 2011 for the first time since the global financial crisis, led by the private retail sector and education spending. We expect growth to rise slowly". The outer atolls can be visited on the two passenger-cargo ships, Nivaga II and Manu Folau, which provide round-trip visits to the outer islands every three or four weeks. 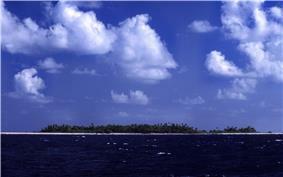 There is guesthouse accommodation on many of the outer atolls. The main island of Funafuti is the focus of travellers, since the only airport in Tuvalu is the Funafuti International Airport and the island has hotel facilities. Ecotourism is a motivation of travellers to Tuvalu. The Funafuti Conservation Area consists of 33 square kilometres (12.74 square miles) of ocean, reef, lagoon, channel and six uninhabited islets. Due to the country's remoteness, tourism is not significant. Visitors totalled 1,684 in 2010, 65% were on business, development officials or technical consultants, 20% were tourists (360 people), and 11% were expatriates returning to visit family. The Islands of Tuvalu consist of six atolls and reef islands. The smallest, Niulakita, was uninhabited until it was settled by people from Niutao in 1949. In July 2013 Tuvalu signed the Memorandum of Understanding (MOU) to establish the Pacific Regional Trade and Development Facility, which Facility originated in 2006, in the context of negotiations for an Economic Partnership Agreement (EPA) between Pacific ACP States and the European Union. The rationale for the creation of the Facility being to improve the delivery of aid to Pacific island countries in support of the Aid-for-Trade (AfT) requirements. The Pacific ACP States are the countries in the Pacific that are signatories to the Cotonou Agreement with the European Union. Tuvalu participates in the operations of the Pacific Island Forum Fisheries Agency (FFA) and the Western and Central Pacific Fisheries Commission (WCPFC). The Tuvaluan government, the US government, and the governments of other Pacific islands, are parties to the South Pacific Tuna Treaty (SPTT), which entered into force in 1988. Tuvalu is also a member of the Parties to the Nauru Agreement which addresses the management of tuna purse seine fishing in the tropical western Pacific. In May 2013 representatives from the United States and the Pacific Islands countries agreed to sign interim arrangement documents to extend the Multilateral Fisheries Treaty (which encompasses the South Pacific Tuna Treaty) to confirm access to the fisheries in the Western and Central Pacific for US tuna boats for 18 months. Tuvalu and the other members of the Pacific Island Forum Fisheries Agency (FFA) and the United States have settled a tuna fishing deal for 2015. The treaty is an extension of the Nauru Agreement (PNA) and provides for US flagged purse seine vessels to fish 8,300 days in the region in return for a payment of US$90 million made up by tuna fishing industry and US-Government contributions. A major international priority for Tuvalu in the UN, at the 2002 Earth Summit in Johannesburg, South Africa and in other international fora, is promoting concern about global warming and the possible sea level rising. Tuvalu advocates ratification and implementation of the Kyoto Protocol. In December 2009 the islands stalled talks on climate change at the United Nations Climate Change Conference in Copenhagen, fearing some other developing countries were not committing fully to binding deals on a reduction in carbon emissions. Their chief negotiator stated, "Tuvalu is one of the most vulnerable countries in the world to climate change and our future rests on the outcome of this meeting." Tuvalu participates in the Alliance of Small Island States (AOSIS), which is a coalition of small island and low-lying coastal countries that have concerns about their vulnerability to the adverse effects of global climate change. Under the Majuro Declaration, which was signed on 5 September 2013, Tuvalu has commitment to implement power generation of 100% renewable energy (between 2013 and 2020), which is proposed to be implemented using Solar PV (95% of demand) and biodiesel (5% of demand). The feasibility of wind power generation will be considered. Tuvalu participates in the operations of the Pacific Islands Applied Geoscience Commission (SOPAC) and the Secretariat of the Pacific Regional Environment Programme (SPREP). Tuvalu maintains close relations with Fiji, New Zealand, Australia, Japan, South Korea, the United Kingdom and the European Union. It has diplomatic relations with the Republic of China (Taiwan); the ROC maintains the only resident embassy in Tuvalu and has a large assistance programme in the islands. Tuvalu participates in the work of Secretariat of the Pacific Community, or SPC (sometimes Pacific Community) and is a member of the Pacific Islands Forum, the Commonwealth of Nations and the United Nations. Tuvalu has maintained a mission at the United Nations in New York City since 2000. Tuvalu is a member of the World Bank and the Asian Development Bank. Crime in Tuvalu is not a significant social problem due to an effective criminal justice system and also due to the influence of the Falekaupule (the traditional assembly of elders of each island) and the central role of religious institutions in the Tuvaluan community. Tuvalu has no regular military forces, and spends no money on the military. Its national police force, the Tuvalu Police Service headquartered in Funafuti includes a maritime surveillance unit, customs, prisons and immigration. Police officers wear British style uniforms. The Law of Tuvalu comprises the Acts voted into law by the Parliament of Tuvalu and statutory instruments that become law; certain Acts passed by the Parliament of the United Kingdom (during the time Tuvalu was either a British protectorate or British colony); the common law; and customary law (particularly in relation to the ownership of land). There are eight Island Courts and Lands Courts; appeals in relation to land disputes are made to the Lands Courts Appeal Panel. Appeals from the Island Courts and the Lands Courts Appeal Panel are made to the Magistrates Court, which has jurisdiction to hear civil cases involving up to $T10,000. The superior court is the High Court of Tuvalu as it has unlimited original jurisdiction to determine the Law of Tuvalu and to hear appeals from the lower courts. Sir Gordon Ward is the current Chief Justice of Tuvalu. Rulings of the High Court can be appealed to the Court of Appeal of Tuvalu. From the Court of Appeal there is a right of appeal to Her Majesty in Council, i.e., the Privy Council in London. There are no formal political parties and election campaigns are largely based on personal/family ties and reputations. From 1974 (the creation of the British colony of Tuvalu) until independence, the legislative body of Tuvalu was called the House of the Assembly or Fale I Fono. Following independence in October 1978 the House of the Assembly was renamed the Parliament of Tuvalu or Palamene o Tuvalu. The unicameral Parliament has 15 members with elections held every four years. The members of parliament select the Prime Minister (who is the head of government) and the Speaker of Parliament. The ministers that form the Cabinet are appointed by the Governor General on the advice of the Prime Minister. Tuvalu is a parliamentary democracy and Commonwealth realm with Queen Elizabeth II serving as the country's head of state and bearing the title Queen of Tuvalu. Since the Queen does not reside in the islands, she is represented in Tuvalu by a Governor General appointed by the Queen upon the advice of the Prime Minister of Tuvalu. The boreholes on Funafuti, at the site now called Darwin's Drill, are the result of drilling conducted by the coral of Pacific atolls. This investigation followed the work on The Structure and Distribution of Coral Reefs conducted by Charles Darwin in the Pacific. Drilling occurred in 1896, 1897 and 1898. Professor Edgeworth David of the University of Sydney was a member of the 1896 "Funafuti Coral Reef Boring Expedition of the Royal Society", under Professor William Sollas and lead the expedition in 1897. Photographers on these trips recorded people, communities, and scenes at Funafuti. Charles Hedley, a naturalist at the Australian Museum, accompanied the 1896 expedition and during his stay on Funafuti collected invertebrate and ethnological objects. The descriptions of these were published in Memoir III of the Australian Museum Sydney between 1896 and 1900. Hedley also wrote the General Account of the Atoll of Funafuti, The Ethnology of Funafuti, and The Mollusca of Funafuti. Edgar Waite was also part of the 1896 expedition and published an account of The mammals, reptiles, and fishes of Funafuti. William Rainbow described the spiders and insects collected at Funafuti in The insect fauna of Funafuti. In 1894 Count Rudolf Festetics de Tolna, his wife Eila (née Haggin) and her daughter Blanche Haggin visited Funafuti aboard the yacht Le Tolna. The Count spent several days photographing men and woman on Funafuti. In 1890 Robert Louis Stevenson, his wife Fanny Vandegrift Stevenson and her son Lloyd Osbourne sailed on the Janet Nicoll, a trading steamer owned by Henderson and Macfarlane of Auckland, New Zealand, which operated between Sydney and Auckland and into the central Pacific. 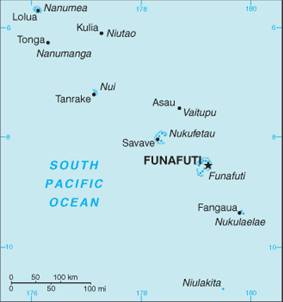 The Janet Nicoll visited Tuvalu; while Fanny records that they made landfall at Funafuti, Niutao and Nanumea, Jane Resture suggests that it was more likely they landed at Nukufetau rather than Funafuti. An account of this voyage was written by Fanny Stevenson and published under the title The Cruise of the Janet Nichol, together with photographs taken by Robert Louis Stevenson and Lloyd Osbourne. 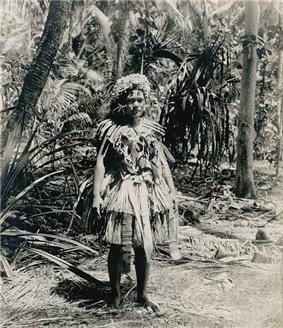 The New Zealand photographer Thomas Andrew visited Funafuti and Nui in about 1885-86. The United States Exploring Expedition under Charles Wilkes visited Funafuti, Nukufetau and Vaitupu in 1841. During this expedition Alfred Thomas Agate, engraver and illustrator, recorded the dress and tattoo patterns of the men of Nukufetau. In the later 1890s and into first decade of the 20th century, structural changes occurred in the operation of the Pacific trading companies; they moved from a practice of having traders resident on each island to instead becoming a business operation where the supercargo (the cargo manager of a trading ship) would deal directly with the islanders when a ship visited an island. From 1900 the numbers of palagi traders in Tuvalu declined with the last of the palagi traders being Fred Whibley on Niutao and Alfred Restieaux on Nukufetau. By 1909 there were no more resident palagi traders representing the trading companies, although both Whibley and Restieaux remained in the islands until their deaths. Trading companies became active in Tuvalu in the mid-nineteenth century; the trading companies engaged Louis Becke, who later found success as a writer, was a trader on Nanumanga from April 1880 until the trading-station was destroyed later that year in a cyclone. He then became a trader on Nukufetau. In 1892, Captain Davis of the HMS Royalist, reported on trading activities and traders on each of the islands visited. Captain Davis identified the following traders in the Ellice Group: Edmund Duffy (Nanumea); Jack Buckland (Niutao); Harry Nitz (Vaitupu); John (also known as Jack) O'Brien (Funafuti); Alfred Restieaux and Emile Fenisot (Nukufetau); and Martin Kleis (Nui). During this time, the greatest number of palagi traders lived on the atolls, acting as agents for the trading companies. Some islands would have competing traders while dryer islands might only have a single trader. Christianity came to Tuvalu in 1861 when Elekana, a deacon of a Congregational church in Manihiki, Cook Islands became caught in a storm and drifted for 8 weeks before landing at Nukulaelae on 10 May 1861. Elekana began proselytising Christianity. He was trained at Malua Theological College, a London Missionary Society school in Samoa, before beginning his work in establishing the Church of Tuvalu. In 1865 the Rev. A. W. Murray of the London Missionary Society – a Protestant congregationalist missionary society – arrived as the first European missionary where he too proselytised among the inhabitants of Tuvalu. By 1878 Protestantism was well established with preachers on each island. In the later 19th Century and early 20th century the ministers of what became the Church of Tuvalu (Te Ekalesia Kelisiano Tuvalu) were predominantly Samoans, who influenced the development of the Tuvaluan language and the music of Tuvalu. For less than a year between 1862–63, Peruvian ships, engaged in what became to be called the "blackbirding" trade, combed the smaller islands of Polynesia from Easter Island in the eastern Pacific to Tuvalu and the southern atolls of the Gilbert Islands (now Kiribati), seeking recruits to fill the extreme labour shortage in Peru. While some islanders were voluntary recruits the "blackbirders" were notorious for enticing islanders on to ships with tricks, such as pretending to be Christian missionaries, as well as kidnapping islanders at gun point. The Rev. A. W. Murray, the earliest European missionary in Tuvalu, reported that in 1863 about 170 people were taken from Funafuti and about 250 were taken from Nukulaelae as there were fewer than 100 of the 300 recorded in 1861 as living on Nukulaelae. 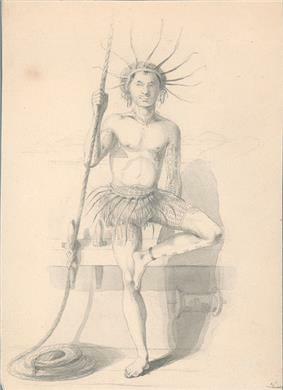 A man from the Nukufetau atoll, drawn by Alfred Agate 1841. Nantucket whaler Independence II has been identified as the first whaler to hunt the waters around Tuvalu. In November 1821 he bartered coconuts from the people of Nukulaelae and also visited Niulakita. A shore camp was established on Sakalua islet of Nukufetau, where coal was used to melt down the whale blubber. In 1820 the Russian explorer Mikhail Lazarev visited Nukufetau as commander of the Mirny. Louis Isidore Duperrey, captain of La Coquille, sailed past Nanumanga in May 1824 during a circumnavigation of the earth (1822–1825). A Dutch expedition (the frigate Maria Reigersberg) found Nui atoll on the morning of June 14, 1825 and named the main island (Fenua Tapu) as Nederlandsch Eiland. The next European to visit was Arent Schuyler de Peyster, of New York, captain of the armed brigantine or privateer Rebecca, sailing under British colours, which passed through the southern Tuvaluan waters in May 1819; de Peyster sighted Nukufetau and Funafuti, which he named Ellice's Island after an English Politician, Edward Ellice, the Member of Parliament for Coventry and the owner of the Rebecca's cargo. Captain John Byron passed through the islands of Tuvalu in 1764 during his circumnavigation of the globe as captain of the Dolphin (1751). Byron charted the atolls as Lagoon Islands. Keith S. Chambers and Doug Munro (1980) identify Niutao as the island that Francisco Mourelle de la Rúa sailed past on 5 May 1781, thus solving what Europeans had called The Mystery of Gran Cocal. Mourelle's map and journal named the island El Gran Cocal ('The Great Coconut Plantation'); however, the latitude and longitude was uncertain. Longitude could only be reckoned crudely as accurate chronometers were unavailable until the late 18th century. Tuvalu was first sighted by Europeans on 16 January 1568 during the voyage of Álvaro de Mandaña from Spain who sailed past Nui and charted it as Isla de Jesús (Spanish for "Island of Jesus") because it was discovered on the day following the feast of the Holy Name. Mendaña made contact with the islanders but was unable to land. During Mendaña's second voyage across the Pacific he passed Niulakita on 29 August 1595, which atoll he named La Solitaria. An important creation myth of the islands of Tuvalu is the story of the Eel and the Flounder; the Flounder reminding the Tuvaluans of the flat atolls. The stories as to the ancestors of the Tuvaluans vary from island to island. On Niutao, Funafuti and Vaitupu the founding ancestor is described as being from Samoa; whereas on Nanumea the founding ancestor is described as being from Tonga. The origins of the people of Tuvalu are addressed in the theories regarding migration into the Pacific that began about 3000 years ago. During pre-European-contact times there was frequent canoe voyaging between the nearer islands including Tonga and Samoa. Eight of the nine islands of Tuvalu were inhabited; thus the name, Tuvalu, means "eight standing together" in Tuvaluan. Possible evidence of fire in the Caves of Nanumanga may indicate human occupation for thousands of years. A referendum was held in December 1974 to determine whether the Gilbert Islands and Ellice Islands should each have their own administration. As a consequence of the referendum, the Gilbert and Ellice Islands colony ceased to exist on 1 January 1976 and the separate British colonies of Kiribati and Tuvalu came into existence. Tuvalu became fully independent within the Commonwealth on 1 October 1978. On 17 September 2000 Tuvalu became the 189th member of the United Nations.